Far from their homes, these brave young Navajo Marines served our nation with honor and dignity. The tale of their exploits remained a closely guarded secret for decades in the event that the Navajo Code Talkers unique talents would be needed again. In 1968 the Navajo code was finally declassified. In July 2001, at the National Capital Rotunda, United States President, the honorable George W. Bush, awarded the Congressional Gold Medals to the first 29 Navajo Code Talkers, their surviving spouses or children. 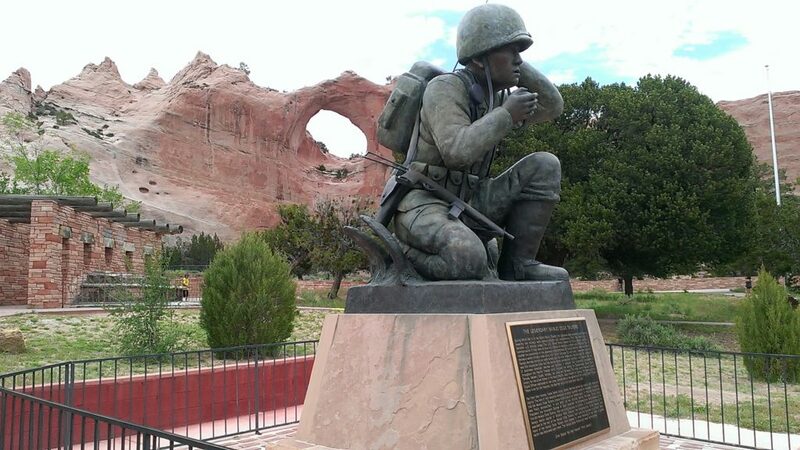 In November 2001 at the Navajo Nation capital of Window Rock Arizona, the Congressional Silver Medals were awarded to the rest of the Navajo Code Talkers, their surviving spouses or children. Sadly, many of the Navajo Code Talkers have passed on never knowing of the honor a grateful nation has bestowed upon them. The Navajo Code Talkers will never be forgotten. Bennallie (or Benallalie), Jimmie D.
Bentone (or Benton), Willie Sr.
Holiday (or Holliday), Samuel T.
Kellwood, Joe (or Joseph) H.
Nagurski, Adolph (or Alolph) N.
Peterson, Joe (or Jose) Sr.
Smith, Samuel Jesse (or Jessie) Sr.
Tabaha, Johnnie (or Johnie) Sr.
Thompson, Everett (or Everitt) M.
Willeto (or Willetto), Frank (or Frankie) Chee Jr.
Yazzie (or Yazhe), Harrison A.